It’s pretty hard to complain about bringing work along on vacation, when this is your early morning workspace. While everyone else snored away below deck, I sat here and typed away to the sound of distant lobster boats, seagulls and the occasional splash of a frolicking seal. I can’t begin to explain how productive this time was for me. 82K words into Black Flagged Apex. I can see the finish line. I just need about three more weeks out on Casco Bay to finish it. Someone has to do it. I survived. How sorry I feel for you! What a terrible place. 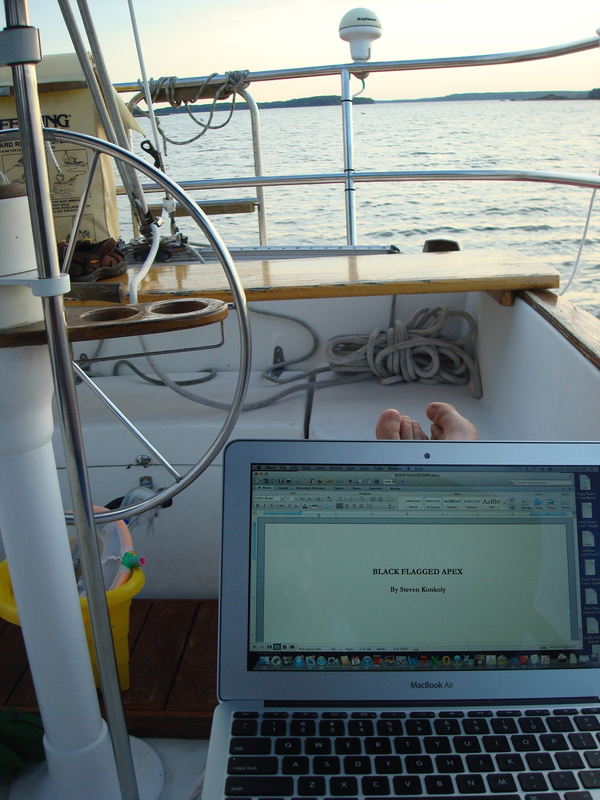 Actually, it probably would be a terrible place for me, I’m horribly seasick, so I don’t think I would get much writing done! Just finished Black Flagged Redux. Oh my, what a novel! When I got to the end (which was a surprise because my Kindle said it was only 87% into the book) I was totally beside myself. I was like an addict needing the next fix. Please tell me Apex will be coming out soon. I need my Konkoly fix! Thanks, Anntarrya! Sorry about the 87% thing. I moved all of the extra material to the end, so prospective readers got more of the book for sampling on Kindle…and I added too many excerpts. I’m putting way less at the end for Apex, which is coming soon. December. 170K words, which is at least 60-80 pages longer (in terms of a hardcover book). 40K more words. I’ll add your email address to the new release list…I should have a few sample chapters up here soon. Oh, what a Christmas this will be! buy followers on twitter for less along with quickly, Get Real likes for the page. purchase twitter followers, select the bundle that will best fits your requirements.